615-607 Dr. Jeannette Graf, M.D. 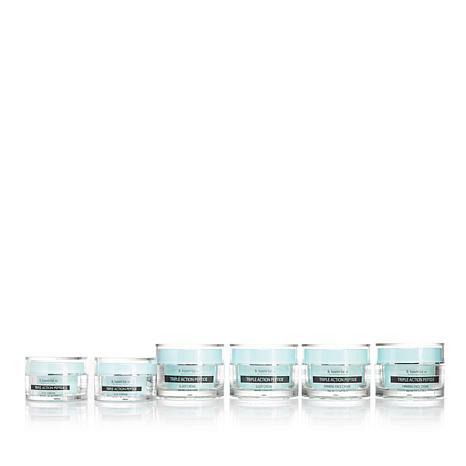 Dr. Graf's Triple Action Peptide skincare can help temporarily firm, tighten and moisturize skin for a more youthful appearance. 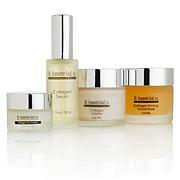 Shop all Dr. Jeannette Graf, M.D. Ingredients: Water (Aqua), Butyrospermum Parkii (Shea) Butter, Moringa Pterygosperma Seed Oil, Beeswax, Cetearyl Alcohol, Polysorbate 80, Theobroma Cacao (Cocoa) Seed Butter, Isopropyl Palmitate, Glycerin, Lecithin, Microcrystalline Wax, Ricinus Communis (Castor) Seed Oil, Citrus Aurantium Dulcis (Orange) Peel Wax, Phenoxyethanol, Moringa Oil/Hydrogenated Moringa Oil Esters, Decapeptide-22, Oligopeptide-78, Palmitoyl Decapeptide-21, Zinc Palmitoyl Nanopeptide-14, Copper Heptapeptide-14 Pantothenate, Heptapeptide-15 Palmitate, Citrus Medica Limonum (Lemon) Peel Extract, Polygonum Fagopyrum Seed Extract, Maslinic Acid, Laminaria Digitata Extract, Diatomaceous Earth, Caprylic/Capric Triglyceride, Xanthan Gum, Disodium EDTA, Sorbitol, Hydrogenated Vegetable Oil, Butylene Glycol, Caprylyl Glycol, Hydrolyzed Wheat Protein, Lactic Acid/Glycolic Acid Copolymer, Polyvinyl Alcohol, Glyceryl Caprylate, Phenypropanol, Dextran, PVP, Bismuth Oxychloride. Ingredients: Water (Aqua), Caprylic/Capric Triglyceride, Helianthus Annuus (Sunflower) Seed Oil, Butylene Glycol, Oleic/Linoleic/Linolenic Polyglycerides, Glyceryl Stearate, PEG-100 Stearate, Squalane, Behenyl Alcohol, Dipalmitoyl Hydroxyproline, Phenoxyethanol, Glycerin, Palmitoyl Oligopeptide, Palmitoyl Tetrapeptide-7, Sodium Dilauramidoglutamide Lysine, Polysorbate 20, Carbomer, Ethylhexylglycerin, Sodium Hydroxide, Tocopheryl Acetate, Allantoin, Sodium Dehydroacetate, Fragrance. Butter, Dimethicone, Glyceryl Stearate, PEG 100 Stearate, Butylene Glycol, Sodium Hyaluronate, Acetyl Hexapeptide-8, Copper Tripeptide-1, Palmitoyl Pentapeptide 4, Palmitoyl Tetrapeptide 7, Palmitoyl Tripeptide, Palmitoyl Oligopeptide, Pseudoalteromonas Ferment Extract, Stearyl Alcohol, Cetyl Alcohol, Phenoxyethanol, Chamomilla Recutita (Matricaria) Flower Extract, Passiflora Incarnata (Passion Flower) Extract, Potassium Sorbate, Acrylates/C10-30 Alkyl Acrylate Crosspolymer, Butylated Hydroxytoluene, Titanium Dioxide, Benzyl Alcohol, Parfum (Fragrance), Tetrasodium EDTA, Caramel, Triethanolamine. Dr Graf deserves that nickname for all her peptide research & discoveries. Her brand is one of many HSN brands that my family buys as gifts for me. I've been using her products for yrs & always will. I have some of her items picked out, now. 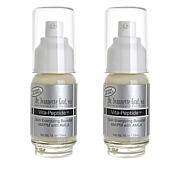 These triple peptide creams make my skin look & feel so much younger & I love using them. People think I'm my son's sister when they meet us. Thank you, Dr. Graf, for that! I tell people about you & your wonderful skincare products. I haven't used this long enough to see results. I hope to. I got this over 3 weeks ago, and I have not seen any tightening at all. I'm keeping the moisturizer because it does have a nice feel to it. But, I've noticed that it does not sink into my face or neck. It just sort of sits on my skin from night until AM.I' would not order again based on the claims that were stressed in the demo. I think once again, it is over sold and does not perform as advertised. Get dermatologist-developed beauty treatments and skin care from a name you can trust - leading American skin care expert and researcher Dr. Jeannette Graf. 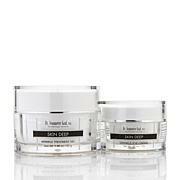 Dr. Graf is renowned for her product development experience with Vita-Peptide™, a group of naturally-occurring organic compounds derived from plankton and yeast. 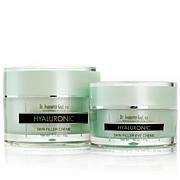 Cleansers, moisturizers and re-energizers help enhance skin tone, firmness and softness for younger-looking skin. Remind me about Dr. Jeannette Graf, M.D. upcoming shows.